It’s extremely difficult to create movies about artists or their sensibilities. The grisled persona of William Dafoe has been used for instance to play both Pasolini and Van Gogh and let’s not forget Kirk Douglas portrayal of the artist in Lust for Life (1956). The tendency to romanticize and/or resort to oversimplifications of an outsized artistic personality and the era out of which his or her art evolved are the pitfalls. 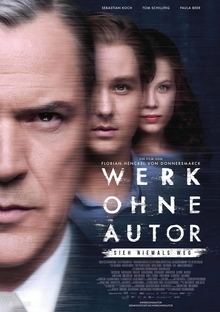 Florian Henckel von Donnersmark’s Never Look Away based up on the life of Gerhard Richter falls into both these traps. The degenerate art exhibits of the Nazi era become facilely conflated Communist era socialist realism. The advent of abstraction in a liberated Germany fares no better, becoming a parody of itself under a curiously similar socialist realist lens. The result in the case of Never Look Away is that a film about a major modernist artist ends up looking like the one-dimensional party line art it initially takes to task. Donnersmark directed The Lives of Others (2006), a complex study of voyeurism and spying under the East German regime and the lack of nuance in respect to creative process in his latest outing is disconcerting. This along with the fact that the film appears to offer autobiographical interpretations of an artist who claimed a certain degree of impersonality (at least as he is portrayed in the film) may explain the estrangement that has occurred between the director and the artist (who had initially cooperated with the project). For instance Kurt Barnert (Tom Schilling), the Richter character is depicted as having an early childhood attachment to an aunt (Saskia Rosendahl) who brazenly exhibits herself to him. The film’s title derives from these early experiences. But it’s all a bit contrived with the trauma of a child’s overstimulation becoming overlaid with that of war under the rubric “everything that is true holds beauty in it.” Ironically a film marquee advertising Hitchcock’s Psycho does more to establish time and place and a body of concerns than all the psychohistory the film strains to assert.